He called off the move to Texas and hastily put together a backup plan: a stint bussing tables at Bucks Restaurant on Tunnel Road. He laughs and admits he only lasted about 10 days in that job. Then, he landed a position at Six Associates, where he worked until starting Griffin Architects in 1979. He complemented the firm with Fireside Antiques, the shop he opened the same year with his business partner, Ron Clemmer. Today, as Griffin walks briskly into the receiving area of his offices in the semi-shadow of All Souls Cathedral in Biltmore Village, a caramel-colored dog, Toby, trots at his heels. The Brussels Griffon’s breed is a nod to the mythical creature with the head, wings, and talons of an eagle and the body of a lion, widely regarded as a powerful protector of great treasures. And Griffin is a more-than-apt surname for this architect whose decades-long career includes protecting and revitalizing many of Asheville’s historic structures. 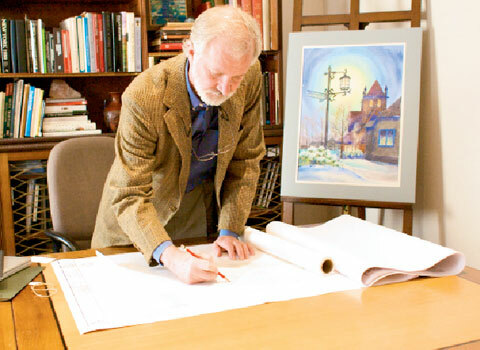 Many know him for his role in the rebirth of Biltmore Village. He served on the North Carolina Board of Preservation at the time, and was instrumental in drafting the design guidelines and the preservation plan. And as he discusses this and other projects, such as the revival of downtown’s Grove Arcade and the historic Montford district, it’s clear these architectural gems are touchstones to his past, and that for Griffin, work and life are closely intertwined. Out of that enterprise, his mother developed a passion for interior design, which she pursued by moving to New York City to earn her degree. When she returned to Mississippi, she opened Fireside Antiques, the namesake for Griffin’s shop and design business. After his father, a pharmacist, had a stroke and was unable to run his drugstore and soda fountain, the family pitched in to keep the business going. “As soon as I could stand up on two crates I was jerking soda,” he says. But the best part about helping out at the shop was that his mother put him in charge of purchasing the stock of comic books and toys, his first instruction in buying. For a while the drugstore kept up operations, and Griffin’s mother kept her antique and gift shop running in the back of the building. Eventually though, the entire business was converted into Fireside Antiques. With the change, Griffin graduated from buying books and toys to purchasing fine furnishings. Accompanied by his mother, the high schooler spent weeks at a time in small English towns seeking out pieces to import. And despite declaring a major in electrical engineering when he entered college, then switching to art before settling on architecture, Griffin says his mother had carefully groomed him for the pursuit. “It was a logical transition from antiques to interiors to architecture. Even now, I create my architecture from the inside out,” he says. This ability to work with what is provided, coupled with an affinity for objects of history is showcased in his pet project—the restoration of Biltmore Village. The effort transformed what was a disheveled collection of homes and shops in the 1970s into a vibrant and treasured district. Designed by Richard Morris Hunt, the architect of Biltmore House, and Richard Sharp Smith, with landscaping by Frederick Law Olmsted, “The Village had one vocabulary for design,” Griffin emphasizes. It reminded him of those towns he had visited in the English countryside, where he had marveled at the architectural cohesion. Both abroad and in the Village, there were no apparent design egos. Griffin himself doesn’t display a trace of ego either, as he lays out three plats of the Village: one from 1907, another from 1990, and his development plan. He simply says, “As a first-time visitor, I was astounded by this gem,” adding that even though modern development had obscured some of the original turn-of-the-century charm, he could see a “piece in the rough” as they call it in the antiques trade. He went door-to-door to collect signatures and petition the city to create an historic district. But he doesn’t rest on the laurels of the Village’s successful adaptive reuse. According to Griffin, all his projects—from historic structures to custom homes—are done with one goal in mind: to be a good neighbor. These days he continues to work on residential and commercial projects with the same eye toward working in harmony with the surroundings. And with Fireside Antiques, he remains connected to his roots. Though she passed away two years ago, his mother’s inspiration lives on. “At some point before she died,” Griffin says, “she expressed regret about not leaving me a larger inheritance. I told her, ‘You have left me the finest inheritance—a positive attitude.’ I love to dream, and I do still try to recognize that adage, ‘can’t never could.’ ” It’s a life lesson that has brought him through many challenges, and no doubt will be the driving force in his work and life for years to come.